And physics jokes have become surprisingly amusing. Curse you KGJ! XD You’re rubbing off on me. Great artwork. 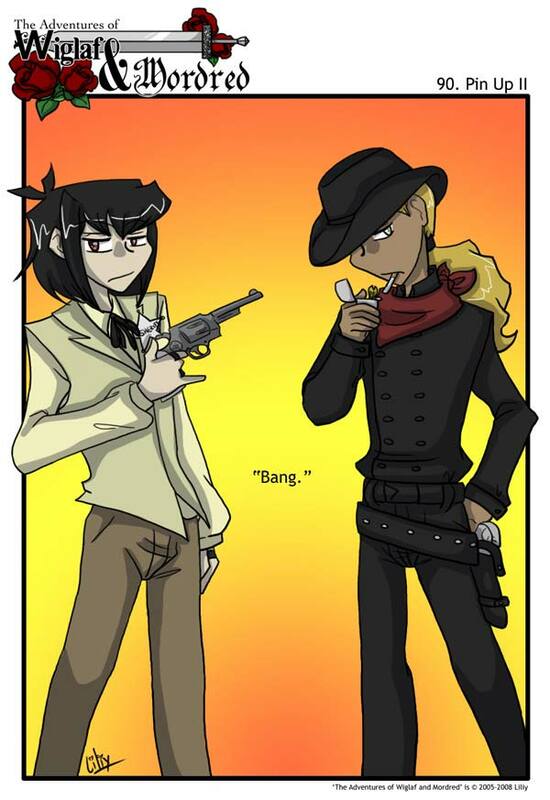 They look very cool as cowboys. Their costumes look nifty and they have terrific dangerous glares on their faces. Excellent! The yellow, orange and red in the background is perfect. It looks like a Western-style sunset scene. I still hold that the french maids would have been better. Lol. Although I do like the random factoid. They really DO like each other! Lmao. Awesome work. Can’t wait for the next one! At the very least, it would have been sexier. Huh. A reverse of “Ringo.” :D Very cool! Wiglaf looks good as a bad guy. I think he should switch to being a villain. With his amazing strength, and other skills he would make a very good villain. Am I the only one who sees a Cowboy Bebop reference here? I miss Wiglaf’s long hair! Glad it made it back for this awesome pin-up, at least.